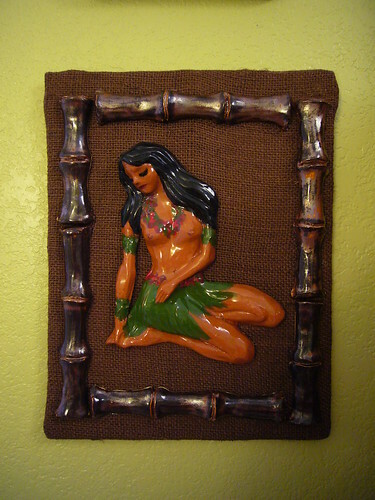 I'm sure you've all poured over the awesome Ohana website: http://www.luauatthelake.com and maybe you've dug into the vendor page: http://www.luauatthelake.com/id8.html . If you did, you probably noticed many old favorites like Fashion Tramp, Velveteen Lounge, and Lake Tiki. Well, I just wanted to highlight a new vendor, Tortuga Tile Works, cause that's LuRu's latest venture. Those of you who made it to the hangover brunch at our place during Bargoylapalooza might have seen some early greenware, but now things are coming out of the kiln at a rapid pace. 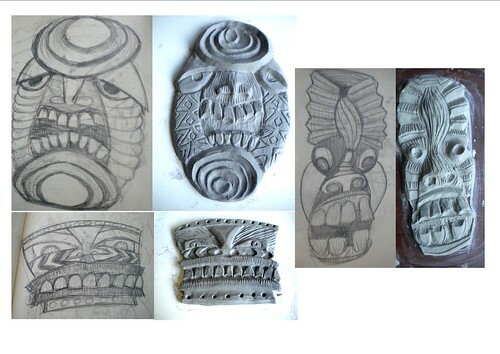 The Atoll line (her tiki themed tiles) will be expanded in time for Ohana (actually, there are things in the kiln now that aren't on the website yet). And, there are several other retro inspired lines that you might be interested in. I won't overload this thread with pics. I'll just point you to her website: http://www.tortugatileworks.com and facebook fan page: http://www.facebook.com/tortugatileworks . We're off to her first art fest vending this weekend in the Florida Keys, where I expect her Deep Sea tiles might do well. Last edited by E33 on Fri Dec 03, 2010 8:53 am, edited 1 time in total. I can't wait to see your wares live at Ohana!!! Note to self: bring even MORE money to Ohana. Nice to get a peek at the glazed versions- even better than just the sculpts, and they looked great! Wait until you see them in person! All done by LuRu's talented hands. Awesome! For those of you not on facebook (or if you are and we're just not connected yet) LuRu just pulled a hot new set of tiles from the kiln: http://www.facebook.com/home.php?#!/alb ... 0885053080 (you don't have to belong to facebook to follow that link). Here's a few examples. For scale reference, the squares are about 3 inch by 3 inch. Those are so cool I actually giggled! Everyone in the office stopped and looked at me. I see a TTW backsplash in the future of my new Sacramento house! You are not moving to the Other Side are you? Have seen Luru's work in person. Really cool. Wish I was that talented. 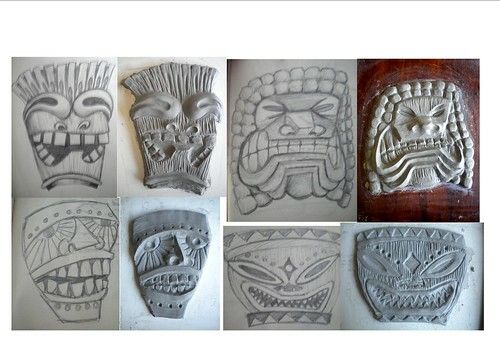 I have been working on some new Tikis, they are about 8" tall. They still need one more go over before I cast them, but I think they are coming along nicely. I LOVE the new tikis! Thanks all. - Finkdaddy, love your new resins. I will certainly be needing some of those! Personal Statement: Only way out is through. I vote for a title change...and keep posting the pics!! "I'm not sure what my spirit animal is, but I'm pretty sure it has rabies"
I am running a sale on my online store for 10% off all orders before the end of this weekend (Dec 6). I have over 250 items available for you gift shopping needs. To get the discount, enter the promo code TCB. Also, if you want to receive future discounts and announcements, please sign up on my mailing list on the home page of my website. This guy is brand new and based on a sculpture that the Burr's have from the Sepik River area of New Guinea. It is an outdoor (except for freezing temps) mosaic adhered to hardy-concrete-board with thinset. He is 18" tall by 7" wide, $100 plus shipping, 4 in stock right now. (not on website yet) His working name has been Steve...what should I really call him? LuRu does great work! I can't wait to collect more artwork. Ooooooo...I want one of these.